There may be something going on with the website. It seems that often when I use it, I get this pop-up about winning a contest and they have a few questions for me about my Chrome browser. This is a known hack. I was getting it for a while but it took me a while to realize I only got it when I went to the Catalina site. Before I realized it I reinstalled chrome, updated my anti-virus software and scanned the devise. It seemed to go away. After a week or so I again went back to the Catalina site an BAM, there it was again. So at this point I am more than suspicious that the site may be infected. This has only happened on an android device, it has not happened on Windows. I have Android and use Chrome. I have not had that problem yet. It is good to know how to fix it. I am using Chrome on my Windows desk top machine and Google on my I-Phone. I have a paid subscription to AVG anti-virus in operation as well and I have NOT seen any evidence of it as yet. I have been having similar issues intermitantly - have stayed away from downloading a flash update as requested. I have seen a ton of spam pop-ups and redirects on this site. I literally just had one on my Galaxy S9 running Google Chrome. On my laptop, Chrome frequently refuses to load the site at all, warning that it has been compromised. I strongly recommend a security audit. +1 - definitly something going on. I *highly* doubt that the website is the source of any of your problems. The server security is fine, and the ads come from Google AdSense. Google is very stringent about the quality of their ads. Anecdotally, I access the site all the time using Chrome on Linux, MacOS, and Android. Never seen anything similar. And other than the couple of folks who have posted here, we've received no complaints or messaging from any of the hundreds of other users. In future, please capture screenshots, especially if as someone claimed Chrome issues a security warning not to proceed. I've communicated a little with the guys on Facebook having this isue and have not seen any emails with screen shots yet. Sounds like the problem is isolated to a few users that may have issues with their browsers and /or Ad settings. Nick - who controls the Ads at the top of our screen? The ads are served by Google. We are able to control what type of content the ad contains and even exclude certain ads or advertisers, using the Google admin console. Yeah, maybe its me and a few other people. Maybe we have a problem with redirects. Maybe we should check? I know it is causing at least a few people to shy away from the site which is exactly the opposite of our goal. Seems like hubris to ignore it. I don't want to come off as a crappy complainer. I really appreciate those who are taking the time to run the site. I'm just a little bit worried. Running a mac, with malware protection, adblocker etc. Thanks for following up. 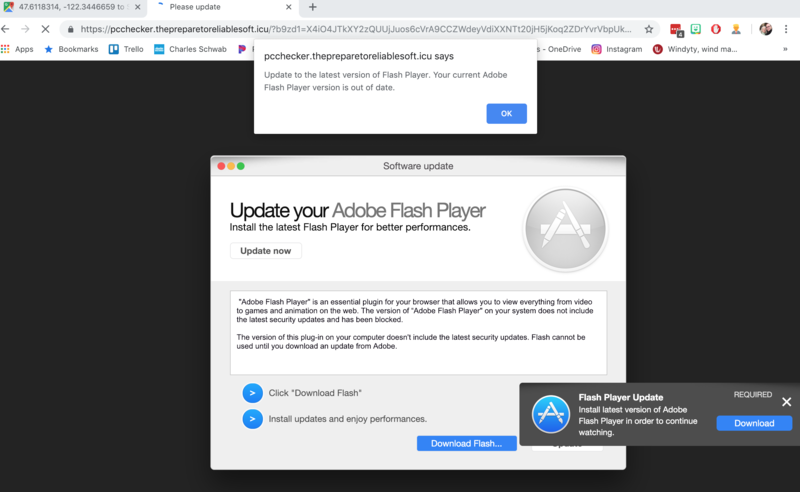 I don't mean to seem hubristic, but there is nothing in your screen shot to suggest that the C36IA website had anything to do with your getting sent to that Flash update page. What were you doing before that happened? If you have AdBlock enabled, you would not even see any ads that might have triggered a redirect -- and you would have to click on such an ad anyway. I'm sorry, but it's still far more likely that you have a virus on your computer. Members see some ads, supposed to be more focused on boats. Non-Members see more.